Any attempt to evaluate the government’s performance must recognize that the approach can cut both ways. He has positive examples to point to, for sure. Xaysana Keopimpha, a Laotian drug lord, was this month jailed for life by a Bangkok court after his arrest in Thailand in January. It was thought at the time that Lao authorities had worked closely with their Thai counterparts on his arrest. It was also rumored that Vientiane had agreed to Xaysana’s capture; he was speculated to have had close ties with prominent Communist Party leaders, including the family of former Prime Minister Thongsing Thammavong, something the family has denied. 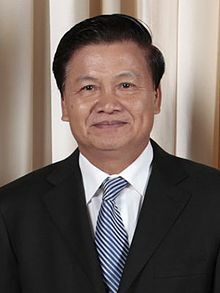 Not long after becoming prime minister in 2016, Thongloun proclaimed a ban on the export of timber and threatened to punish politicians engaging in the trade. In recent months he has dismissed two provincial governors – one from Attapeu, the other from Xieng Khouang – for doing just that. Speaking to government officials earlier this month, Thongloun said that issues of drugs and illegal weapons “must be addressed,” while adding that “the Ministry of Public Security must do more and enforce tougher measures to combat drug trafficking and the illegal weapons trade.” He went on: “Harsh penalties must be meted out against those who are arrested.” Thongloun was quite clear as to why the Party needs to achieve these goals. “This will build public confidence. We have to show people that we are serious about this,” he said. What’s behind this renewed toughness on crime? Part of it may be rooted in growing fears that some Laotians may otherwise be losing confidence in the Communist Party. Many privately say the Party’s core appeal is losing its legitimacy as the cost of living sores, drug addiction rates grow, and corruption worsens. More broadly, while Thongloun certainly has been cracking down harder than his predecessors on graft, government waste, and crime, there are concerns about how he understands the semantics of law and order. Indeed, his administration has also punished even the mildest of critics with lengthy prison sentences, shuttered any attempts at public protest through police brutality, and allegedly tortured prisoners. If Thongloun is reformist when it comes to how he wants Party officials to behave, he is still as regressive as his processors when it comes to how he wants ordinary Laotians to behave. Vietnam claims there are no political prisoners, only people who have ‘violated the law’. But the fact is that Vietnam’s domestic legislation is incompatible with international law. Instead of developing the rule of law, Vietnam is enforcing the rule by law, by adopting a whole arsenal of legislation that nullifies human rights. The same goes for Laos. Take the Decree on Associations No. 238, which came into effect in November. I covered this decree in an article for The Diplomat in January (See: Beware the Destruction of Civil Society in Laos) so I won’t go into much detail, except to say it is an attempt to financially stifle the country’s civil society organizations (CSOs). But it does this through appeals to the law. Indeed, one condition bars CSOs from “abusing the rights to freedom.” Freedom, here, is defined however the Party wants it to be defined. Another caveat attempts to bring CSOs in line with laws on other organizations, namely how businesses operate financially. But while it makes sense for the government to have oversight of finances of for-profit companies, it seems more draconian for nonprofit civil society bodies. Thongloun’s law-and-order agenda strikes both ways; progressive when it comes to cleaning up corruption and crime, but regressive when it comes to political rights. In short, it is about how the Communist Party wants to “order” society, and which “laws” it thinks are necessary to do so. In another sense, it is an attempt to update (judicially, not extrajudicially) the Party’s outdated motto, which might be simplistically boiled down to: we take care of everything, so the people don’t need to worry. Are Cambodia and Laos Really Any Closer to Resolving Their Border Dispute?New Guard, Old Problems: What Sombath Somphone's Continued Disappearance Says About Rights in LaosLaos Deports 3 Detained US Missionaries, Evangelical Group ClaimsCan ASEAN Play a Greater Role in the Mekong Subregion?What’s Next for the Cambodia-Laos Border Dispute?